Etiquetas: 16, anales tutmosis III, anticristo, antiguo Testamento, apocalipsis 16, Armagedon, batalla megido, cartas amarna, egipto, estratos megido, israel, La estela de Gebel Barkal, lista de ciudades sirio-palestinas tomadas por tutmosis III, megiddo chronology, megiddo situacion, principe de kadesh, tell de megido, templo amon karnak, tutmosis III, valle jezrael, via maris entre egipto y mesopotamia. El tell de Megido/Megiddo,Israel, desde el aire. Dedicado a los que “quieren saber más” de…y no dudan nada. Como dice Karr, ” a veces me siento tentado de admirar la gran seguridad que tienen de sus conocimientos mis colegas, lo malo es que su seguridad deriva de su desconocimiento”. ¡Feliz Año 2010¡ Y que os gusten los “millones de enemigos” que lucharon contra Tutmosis III en Canaán. Megiddo is the jewel in the crown of biblical archaeology. Strategically perched above the most important land route in the ancient Near East, the city dominated international traffic for over 6,000 years â€“ from ca. 7,000 B.C.E. through to biblical times. As civilizations came and went, succeeding settlements at ancient Megiddo were built on the ruins of their predecessors, creating a multi-layered archaeological legacy that abounds in unparalleled treasures that include monumental temples, lavish palaces, mighty fortifications, and remarkably-engineered water systems. The intresting part about this place is that it is shaped, formed and created like an altar (ritualistic sacrificial altar). * only site in Biblical lands with remains of 30 cities built one on top of each other. * scene of many battles that decided the fate of nations and empires. * guards the most important highway of the ancient world, the Via Maris that connected Egypt with Mesopotamia. * linked to numerous great figures in world history, among them King Solomon of Israel and King Josiah of late-monarchic Judah, Pharaohs Thutmose III, Shishak and Necho of Egypt and Kings Tiglath-pileser III and Esar haddon Assyria â€” and the Antichrist. Megido (hebreo: מגידו), Mageddo o Meguiddó, es una colina de Israel, situada 90 km al norte de Jerusalén y 31 km al sudoeste de la ciudad de Haifa. Se conoce también como Har Megiddo (hebreo) y Tell al-Mutesellim (árabe). En 2005, las ruinas de Megido fueron consideradas Patrimonio de la Humanidad por la Unesco como parte del sitio «Tells bíblicos – Megido, Jasor, Beer Sheba». 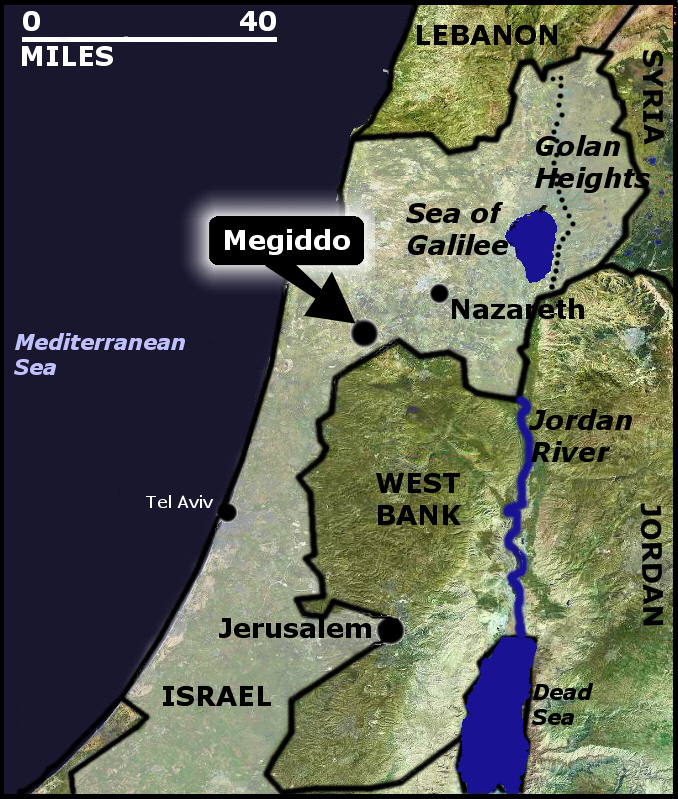 According to archeologists, the city of Megiddo was destroyed around 1130 BCE . Within the walls of Megiddo was a palace 260 feet long and 100 feet wide- a huge building for it’s time. Pictured here is a replica of biblical Megiddo, around 1000 BCE. King Ahab’s Stables: Megiddo was at its prime during King Ahab’s reign as King of the ten Northern Israel tribes. Within the Megiddo complex there were stables for 450 horses; Megiddo was therefore a major base for King Ahab’s forces. http://www.bibleplaces.com/newsletter/hr/Megiddo_tell_aerial_from_southeast,_tb121704999pp.jpg The water tunnel at Megiddo dating from the time of Solomon. King Solomon was interested in the strategic value of Megiddo so he fortified it, building this water tunnel in the event of a siege (Kings I 9:15). 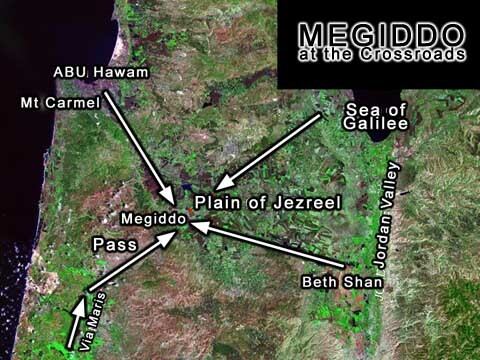 However, during Solomon’s time, Megiddo was primarily an administrative center. En tiempos antiguos, Megido era una ciudad importante, apareciendo su nombre en jeroglíficos egipcios y en escritura cuneiforme: en las “cartas de Amarna“; gozaba de una importante situación estratégica, pues dominaba una vía de comunicación primordial en el Valle de Jezreel, a la salida de los desfiladeros del Carmelo, al nortoccidente de Tanak y en el camino de esta ciudad al Tabor. Era una de las estaciones principales en el camino que seguían los ejércitos en dirección de Egipto a Siria. Tras la ocupación por los hebreos, fue situada en el territorio de Isacar, pero atribuida a la tribu de Manasés. Sobre su situación, Jakut, geógrafo árabe del siglo XII, dice que “Ledjun es la antigua ciudad de Mageddo que recibió, bajo la dominación romana, el nombre de Legio“. En sus inmediaciones se entablaron tres célebres batallas, una durante el siglo XV a. C., de las más antiguas documentada, y otras dos, en los años 609 adC y 1918. Es un valioso lugar arqueológico, un montículo con 26 estratos de ruinas de antiguos asentamientos, conocido por motivos históricos, teológicos y geográficos. ↑ a b El contenido de este artículo incorpora material del tomo 32 de la Enciclopedia Universal Ilustrada Europeo-Americana (Espasa), con copyright anterior a 1927, el cual se encuentra en el dominio público. This page briefly reviews the Egyptian textual information relating to Thutmose III’s victory over Canaanite kings near Megiddo. In the New Chronology, this battle is of no especial significance. Conventionally, however, with an early Exodus at the start of the Hyksos era, the possibility of matching this with Barak’s involvement with the defeat of Jabin and Sisera arises. The following map shows the route Thutmose III chose to approach his adversaries, together with other salient features nearby. The pass he chose to lead his army along had been considered unsuitable for a large body of men – part of the Egyptian texts lay stress on the Pharaoh’s skill and judgement in insisting on this in the face of reluctance. There was a vulnerable time when the Egyptian army began to emerge into the Jezreel Valley, as only a small fraction of the whole was present at first. It is something of a mystery why the Canaanite coalition did not take advantage of this – perhaps it was assumed to be only a small diversionary tactic while the main body of men followed the major routes round towards either Taanach or Megiddo. The account in Judges describes Barak and his men descending from Mount Tabor, on the northern side of the Valley of Jezreel. This was of course from an entirely different direction to the advance of the much more powerful Egyptian force. If Barak was present at the battle, the Egyptian sources do not record this, their main purpose being to highlight the skill and prowess of Thutmose himself. The following map shows the route Thutmose III chose to approach his adversaries, together with other salient features nearby. The pass he chose to lead his army along had been considered unsuitable for a large body of men – part of the Egyptian texts lay stress on the Pharaoh’s skill and judgement in insisting on this in the face of reluctance. There was a vulnerable time when the Egyptian army began to emerge into the Jezreel Valley, as only a small fraction of the whole was present at first. It is something of a mystery why the Canaanite coalition did not take advantage of this – perhaps it was assumed to be only a small diversionary tactic while the main body of men followed the major routes round towards either Taanach or Megiddo. The account in Judges describes Barak and his men descending from Mount Tabor, on the northern side of the Valley of Jezreel. This was of course from an entirely different direction to the advance of the much more powerful Egyptian force. If Barak was present at the battle, the Egyptian sources do not record this, their main purpose being to highlight the skill and prowess of Thutmose himself. Now while the rear of his majesty’s victorious army was (still) at [the town] of Aruna, the vanguard had come out into the [Qi]na Valley … His majesty reached the south of Megiddo on the bank of the Qina brook … The southern wing of his majesty’s army was at a hill south of [the] Qina [brook], and the northern wing was to the northwest of Megiddo, while his majesty was in their centre. Thereupon his majesty prevailed over them at the head of his army. Then they saw his majesty prevailing over them, and they fled headlong [to] Megiddo with faces of fear. They abandoned their horses and their chariots of gold and silver, so that someone might draw them [up] into this town by hoisting on their garments … Then their horses and their chariots of gold and silver were captured as an easy [prey. Ranks] of then were lying stretched out on their backs light fish in the bight of a net. Gracias a los ‘Anales’ tenemos una gran descripción de la batalla y, sobretodo, un calendario bastante ajustado de las diferentes etapas que se produjeron. According to Thutmose III’s Hall of Annals in the Temple of Amun at Karnak, the battle occurred on “Year 23, I Shemu [day] 21, the exact day of the feast of the new moon” – a lunar date. This date corresponds to May 9, 1457 BC based on Thutmose III’s accession in 1479 BC. After victory in battle, however, his troops stopped to plunder the enemy and the enemy was able to escape into Megiddo.. Thutmose was forced to besiege the city instead, but he finally succeeded in conquering it after a siege of seven or eight months (see Siege of Megiddo). kings all gave Thutmose gifts, which he alleged to be “tribute” when he recorded it on the walls of Karnak. The only noticeable absence is Mitanni, which would bear the brunt of the following Egyptian campaigns into Asia. Él me cedió las tierras extranjeras de Retenu durante la primera expedición. Ellos vinieron para enfrentarse con Mi Majestad, siendo millones de hombres, cientos de miles de los mejores de todas las tierras extranjeras, montados en sus carros, 330 príncipes, cada uno con su ejército. Estaban en el Valle de Qina, preparados para la batalla en un estrecho desfile. He [Amon-Re] entrusted to me the foreign countries of Retenu on the first campaign, when they had come out to engage with my majesty, being millions and hundred-thousands of men, the individuals of every foreign country, waiting in their chariots – 330 princes, every one of them having his (own) army. When they were in the Qina Valley … good fortune befell me among them, when my majesty attacked them. Then they fled immediately or fell prostrate. When they entered into Megiddo, my majesty shut them up for a period up to 7 months … Then that enemy and the princes who were with him sent out to my majesty, with all their children carrying abundant tribute: gold and silver, all their horses which were with them, their great chariots of gold and silver, as well as those which were plain, all their coats of mail, their bows, their arrows, and all their weapons of warfare. En este mapa sacado de la pagina Megiddo.tau.ac.il se observa la localización de Megiddo y la del estrecho de Aruna aparecen en rojo las otras alternativas y en verde la que eligio Tutmosis. 2 Jabin, a king of Canaan who reigned in Hazor. The commander of his army was Sisera who lived in Harosheth Haggoyim … 3 he had 900 iron chariots. 12 When they told Sisera that Barak … had gone up to Mount Tabor,13 Sisera gathered together his 900 iron chariots and all the men with him, from Harosheth Haggoyim to the Kishon River. 14 So Barak went down Mount Tabor followed by 10,000 men. 15 At Barak’s advance, Yahweh routed Sisera and all his chariots and army by the sword, and Sisera abandoned his chariot and fled on foot. 23 On that day God subdued Jabin, the Canaanite king, before the Israelites. 24And the hand of the Israelites grew stronger and stronger against Jabin, the Canaanite king, until they destroyed him. 21 The River Kishon swept them away. Etiquetas: anales tutmosis III, batalla megido, egipto, el Napoleón de Egipto, isis forma arbol, libro del amduat, Megido, museo arqueologico madrid, museo arqueologico nacional, reproduccion tumba tutmosis III, sokar, tumba tutmosis III, tutmosis III. Este gran personaje no necesita presentacion, lamentablemente su momia esta relativamente mal conservada si se le compara con la de faraones posteriores. Resulta interesante el que este faraon al que se ha llamado “el Napoleon del Egipto Antiguo” haya sido bastante bajo de estatura, apenas media alrededor de un metro y medio. (Que por otra parte, estaba dentro de los limites de lo usual entre los egipcios). MADRID.- En la ardiente oscuridad, a la hora imprecisa de los búhos y las alimañas, el Sol emprende un viaje de tinieblas, un tránsito de 12 horas donde la vida se escribe en un lenguaje secreto, con signos de luna. Pero en esta aventura el sol no viaja solo, sino que desde el 1.425 a.C. lo hace junto a Tutmosis III, el gran faraón de la XVIII dinastía, el Napoleón egipcio, aquel que extendió sus fronteras hasta el horizonte. Menjeperra Thutmose, Thutmose III o Tutmosis III, es el sexto faraón de la dinastía XVIII de Egipto; gobernó de c. 1479 a 1425 a. C.,  siendo uno de los monarcas más importante y poderoso de los tres mil años de civilización faraónica. 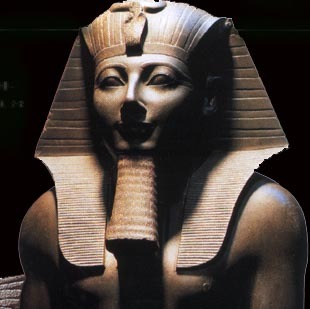 A la muerte de Hatshepsut, Tutmosis III fue por fin rey único de Egipto, sin ninguna atadura. Podría pensarse que fue él quien libero su cólera sobre la figura de la difunta reina, aniquilando su memoria y usurpando sus numerosos monumentos. Pero esta primera teoría esta siendo rebatida por los egiptólogos. Según esta tesis, fue el clero de Osiris quienes empezaron con la destrucción de la memoria de la reina, la cual se produjo 20 años después de su muerte. El hecho de esperar este tiempo puede deberse a que tenia que acabar el reinado de Tutmosis III y producirse la muerte de Senenmut, de lo contrario, no lo hubiesen permitido. Otro dato que se apoya en esta teoría es que el templo funerario de Tutmosis III fue encontrado sobre una parte del de Hatshepsut, un emplazamiento inverosimil para alguien que quería distanciarse de todo lo que representaba su tia-madrastra. Una nueva teoría acerca de esta extraña corregencia es que mientras la reina gobernaba Egipto , el faraón Tutmosis III prefería la vida militar y expandir las fronteras del país más allá de lo que lo hizo su abuelo Tutmosis I.
Nut, en la tumba de Tutmosis III, en el valle de los Reyes. Su tumba fue descubierta por los trabajadores de Victor Loret en 1898; tras limpiaría con cuidado, se hizo un plan de donde había sido encontrado cada objeto. La tumba había sido robada en la antigüedad -la momia de Tuthmosis III ya había sido encontrada (en 1881) en el escondrijo llamado TT320. Los objetos encontrados en la tumba estaban en mal estado -los ladrones de tumbas habían sido poco cuidadosos en su búsqueda y el sarcófago había sido dañado al retirar la tapa, las figuras de madera encontradas en la tumba habían sido lanzadas con fuerza contra las paredes para quitarles el doradLa decoración de las paredes supone el aspecto más impactante de esta pieza única, reproducida por vez primera. Tutmosis III hizo grabar en su cámara funeraria la primera copia completa del Libro de Amduat -traducido íntegro al castellano en el catálogo de la muestra-, composición religiosa que describe el viaje nocturno del dios Sol a través del mundo del más allá. «Los antiguos egipcios», comenta con entusiasmo la comisaria, «creían firmemente en una vida después de la muerte. Lo que aquí se hace es reproducir esa creencia que forma parte de una civilización entera». Así, el viaje emprendido por el dios, acompañado en su barca de otras divinidades y genios protectores, supone un regreso desde la muerte hacia la vida que culmina al amanecer para iniciarse cada noche. La reproducción exacta de la tumba de Tutmosis III -que supone también la primera que se puede visitar en España de un faraón egipcio- ha sido posible tras seis meses de trabajo, realizados por la empresa Factum Arte. «Después del trabajo de campo en la cámara original, reprodujimos en Madrid hasta el último detalle posible, con toda la fidelidad que hoy ofrecen las nuevas tecnologías», comentó un miembro del equipo de trabajo. –dios de la oscuridad, de la Duat (el Mundo Inferior) y la decadencia en la Tierra, según la mitología egipcia. Era protector de los muertos y patrón de los herreros.Tumba de Tutmosis III,Valle de los Reyes,Luxor,Egipto. Junto a la reproducción de la tumba expuesta en Madrid, una selección con 30 objetos recuperados de ajuares funerarios de Egipto completan la muestra, «algunos de ellos rescatados de los almacenes del museo y que resultan inéditos para el público», anunció el director del Arqueológico Nacional, Miguel Angel Elvira. La fiebre constructora del faraón protagonista sólo pudo igualarse a la de Ramsés II, pero en el caso de Tutmosis III el halo de su ferocidad guerrera se unió a anécdotas y curiosidades que le han galvanizado como un heterodoxo del imperio: por ejemplo, su bastardía (que no le impidió llegar al trono) o la introducción de la mandrágora en Egipto, la planta de los excesos y las travesías místicas, sanativa y lisérgica. La irreverencia de Tutmosis, aquél que quiso acompañar al Sol por el lado oscuro de la vida, tuvo como víctimas a algunos de sus antecesores, de los que fue borrando huellas, aniquilando rastros y memoria. Reinó solo. Esa fue su obsesión mejor alimentada.Y en su tumba, como si le acompañara el vaho vitriólico de la mandrágora, se hizo arropar para la eternidad, que es la posteridad de los faraones, por una fábula fascinante y un tratado de resurrección. En los 34 años que Tutmosis III gobernó completamente solo emprendió numerosas campañas, tanto en el Próximo Oriente como en Nubia y emulando a su abuelo, el gran Tutmosis I, realizó numerosas conquistas. Condujo al menos 17 campañas militares a Palestina y Siria, y alcanzó el Eúfrates. Bajo su reinado Egipto alcanzó su máxima extensión, con dominios en Siria, Canaán, el Sinaí y toda Nubia, además de efectivos contactos comerciales con los reinos vecinos. Tal vez la batalla más brillante librada por el faraón, tuvo lugar en Meguido (Meggido). Donde el faraón y su ejército tuvieron que atravesar un angosto desfiladero, para así sorprender al entonces príncipe de Kadesh, el cual esperaba el ataque por otra zona más accesible y por la cual pensaba que atacaría el faraón. Esta batalla esta registrada en los llamados Anales del templo de Amon de Karnak. Los dos últimos años de reinado de Tutmosis III los compartió con su hijo, el joven Amenhotep II, en una corregencia en la que le adiestró en el manejo del poder, aunque seguramente de forma más cordial a la que tuvo Hatshepsut con él. Fue enterrado en el Valle de los Reyes en la tumba KV34 dónde se encuentra la versión más completa de Libro del Amduat, y su momia fue una de las halladas en el escondrijo de Deir el-Bahari, aunque en mal estado de conservación.